Travel, especially in developing countries, comes with varying levels of exposure to potential health issues. The time-tested tips in this article can help you stay healthy on your next trip. If your travel plans take you to Western Europe or other industrialized countries, health issues are usually less of a concern. But if you’re traveling to a developing country, you should start planning several months in advance. Get immunized: Some immunizations need to be administered several months before you leave. Other medications, such as those for malaria, need to be taken before, during and after your trip. Make sure you get an international health certificate from your doctor documenting your immunizations. Research health concerns: The websites for the Centers for Disease Control and Prevention and the World Health Organization have current health information for all countries, including recent outbreaks and immunizations needed. See your doctors: Get a checkup from your family doctor, and visit your dentist and optometrist. It’s easier to address minor problems at home. Review first-aid skills: If you’ll be traveling in remote areas, brush up on your first-aid skills by reading books or taking a class. Check your local REI store for classes taught by the NOLS Wilderness Medicine Institute. Pack your first-aid kit: Make certain your first-aid kit has all the basic supplies. Include your prescription medications (in their original containers), copies of your prescriptions and immunization records plus an extra pair of glasses or contact lenses, if needed. If you’ll be traveling in areas with poor medical facilities and a high incidence of disease, pack sterilized needles and syringes with a doctor’s note explaining that they are for medical use only. If possible, get the note written in English and in your destination’s dominant language to avoid problems with customs. Choose travel insurance: The type of travel insurance you need depends on your personal insurance policies, your destination and your planned activities. Boil it, peel it or don’t eat it: Avoid salads and fresh fruits. Fruits that cannot be peeled should be soaked in a mild iodine or bleach solution. Eat only steaming hot foods: Pass up foods that have been sitting all day and are reheated. Avoid dairy products: In tropical climates where pasteurization and refrigeration are questionable, avoid dishes made with dairy products. Take acidophilus tablets: Available at health food stores, acidophilus is natural yogurt culture that can help your body deal with bacteria. Or simply eat yogurt while you’re traveling. Boil, purify or disinfect: In developing countries, treat all water unless you purchase bottled water. Do not consume drinks with ice. Brush your teeth and wash vegetables with treated water as well. Check bottled water: When buying bottled water, check the seal to make sure it hasn’t been opened and refilled with tap water. Bottles of carbonated water are the most tamper-resistant. Stay hydrated: Don’t let your concerns about water safety keep you from drinking enough water. Staying hydrated will help keep you healthy. Common in Central and South America, Africa, Asia and the Middle East, the AARP says that malaria is transmitted by infected mosquitoes. Other diseases transmitted by mosquitoes and flies include yellow fever, sleeping sickness, leishmaniasis and Japanese encephalitis. Take medication: Preventive medication needs to be taken before, during and after your trip. See your doctor for more information. Cover up: Mosquitoes bite most frequently between dusk and dawn. Wear long-sleeve shirts and pants treated with permethrin; use insect repellent on exposed skin. Use mosquito nets: At night use a mosquito net treated with permethrin. Parasites such as worms and flukes can be transmitted by ingesting contaminated food or water or via direct contact with skin. Always wear shoes: To prevent infection, wear shoes or sandals at all times, even when at your accommodation. Avoid swimming in fresh water: In high-risk areas (including many parts of the Middle East, Africa, Asia and South America) swim only in saltwater or chlorinated pools. Travel guru Rick Steves says that some of the health risks associated with wilderness travel anywhere in the world include sunburn, blisters, poison ivy, insects, ticks, snakebites, hantavirus and altitude sickness. There can also be additional health concerns related to temperature extremes—heat fatigue, heat exhaustion and heat stroke, as well as dehydration, hypothermia and frostbite. Despite your best intentions, it’s still possible you could get sick during your trip or after you return home. See a doctor: Seek medical attention as soon as possible. You could simply have a case of traveler’s diarrhea, or you could have a potentially life-threatening disease. 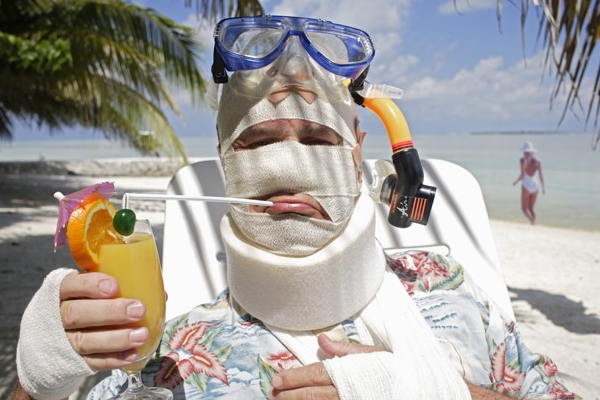 You just don’t know until you see a doctor, which is why you have travel insurance. For traveler’s diarrhea: Drink a lot of fluids to prevent dehydration. Use the oral rehydration salts in your first-aid kit or sports drinks, if available. For severe cases, avoid taking medication to stop diarrhea. This will just keep the bacteria in your system longer and extend your illness. See your doctor: If you come down with a fever or flu-like illness up to a year after returning from your trip, don’t hesitate to see your doctor. Diseases such as malaria can take up to a year to appear. Make sure to tell your doctor all the countries you’ve visited within the year.